QuadV are here at epic.EIGHT providing great coverage and commentary on matches. We've set up an internal stream for people at the event. If you're not at epic.EIGHT, you can follow the action and the live stream over at Tek-9. 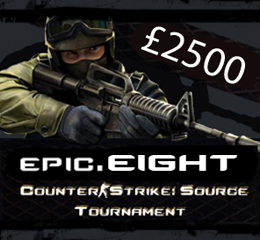 And finally, you can get all the latest results and match information here, at tournaments.epiclan.co.uk. 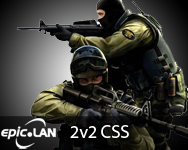 To keep you occupied this evening we shall be running a 2v2 counter-strike: source tournament. This will commence as soon as the group stages of the main tournament finish which is anticipated to be about 7:30pm. 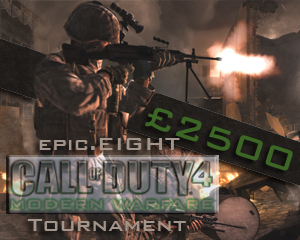 Signups are now open so get organising yourselves into pairs for this tournament. Please make sure you are logged into the tournament site to see match information. The tournaments for epic.EIGHT are now open. Please ensure that your whole team is fully signed up to the system by the Thursday of the event so that matches can be scheduled as early as possible. We've moved the tournament information for epic.SEVEN into our tournament archive. To see information about teams, matches and results, use the links below. We'll be opening tournament signups for epic.EIGHT soon!